FILO trying to load menu.lst. Expected usage is to flash it into the BIOS ROM together with coreboot. Supports boot disk image of El Torito bootable CD-ROM. "hdc1" means the boot disk image of the CD-ROM at hdc. Only the x86 (x64) architecture is currently supported. Some efforts have been made to get FILO running on PPC. Contact the coreboot mailinglist for more information. Recent version of GNU toolchain is required to build. We have tested with Debian/woody (gcc 2.95.4, binutils 2.12.90.0.1, make 3.79.1), Debian/sid (gcc 3.3.2, binutils 2.14.90.0.6, make 3.80) and different versions of SUSE Linux from 9.0 to 11.0. FILO will use the coreboot crossgcc if you have it built and it can be found. FILO uses coreboot's libpayload. It is easiest to locate and build FILO in the coreboot/payloads directory. 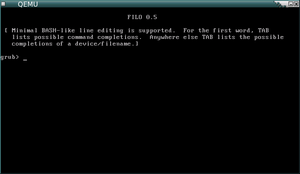 If you will be building FILO on AMD64 platform for Debian install the gcc-multilib package. This will run menuconfig twice -- the first time for libpayload, the second time for FILO. Then running make will build filo.elf, the ELF boot image of FILO. $ make CC="gcc -m32" LD="ld -b elf32-i386" HOSTCC="gcc" AS="as --32"
Use build/filo.elf as your payload of coreboot, or a boot image for Etherboot. It has been significantly enhanced and is now maintained by Stefan Reinauer. If you experience trouble compiling or using FILO, please report with a build log or detailed error description to the coreboot mailing list. To boot a CD-ROM or DVD you only need to specify the drive without a partition number. For example to boot to the primary drive on the secondary IDE channel you would use hdc and not hdc1 in FILO. If you are using FILO with CONFIG_USE_GRUB, and want to boot to your Linux install disk you have to do a mixture of GRUB and FILO commands. Like GRUB you have to append a kernel (and parameters), then an initrd, and give a boot command. Like FILO you have to give absolute paths. Your system will now boot right into the Linux install. 'boot_devices' can contain a list of boot devices seperated by semicolons. FILO will try to load filo.lst / menu.lst from any of these devices. To be able to contribute you will need a Gerrit account. See Git on how to get one and how to push new code to the repository. The instructions there are valid also for FILO, just change coreboot to filo in directory names etc. (not hostnames). This page was last modified on 30 August 2013, at 13:44.